Presented at the Presented at the International Conference on Auditory Display (ICAD), Michigan, US. In: The Sonification Handbook. Hermann T, Hunt A, Neuhoff JG (Eds); Berlin, Germany: Logos Publishing House: 237-272. Supplementary Material for "A SuperCollider Class for Vowel Synthesis and its Use for Sonification"
Grond F, Bovermann T, Hermann T (2011) : Bielefeld University. doi:10.4119/unibi/2702594. In: The 17th Annual Conference on Auditory Display, Budapest, Hungary 20-24 June, 2011, Proceedings. Worall D, Wersényi G (Eds); Budapest, Hungary: OPAKFI. In: Sonic Interaction Design - Exhibition Catalogue. Behrendt F, Lossius T (Eds); Bergen, Norway: BEK: Bergen Center for Electronic Arts: 14-17. In: The SuperCollider Book. Wilson S, Cottle D, Collins N (Eds); Cambridge: MIT Press: 237-270. In: The SuperCollider Book. Wilson S, Cottle D, Collins N (Eds); Cambridge: MIT Press: 381-408. In: The SuperCollider Book. Wilson S, Cottle D, Collins N (Eds); Cambridge: MIT Press: 105-126.
International Journal on Ambient Computing and Intelligence (IJACI) 2(2): 27-41. Supplementary Material for "Auditory Augmentation"
Bovermann T, Tünnermann R, Hermann T (2010) : Bielefeld University. doi:10.4119/unibi/2763923. In: Auditory Display. Aramaki M, Kronland-Martinet R, Ystad S, Jensen K (Eds); Lecture Notes in Computer Science, 5954. Berlin, Heidelberg: Springer: 166-183. In: Proceedings of the 13th International Conference on Human-Computer Interaction. New York, Heidelberg: Springer: 422-426. Supplementary Material for "AudioDB: Get in Touch with Sounds"
Bovermann T, Elbrechter C, Hermann T, Ritter H (2008) : Bielefeld University. doi:10.4119/unibi/2698572. In: Proceedings of the 14th International Conference on Auditory Display. Susini P, Warusfel O (Eds); Paris, France: ICAD. In: Proceedings of the 2008 Conference on Pervasive Computing. In: Proceedings of the 14th International Conference on Auditory Display. Susini P, Warusfel O (Eds); Paris, France: International Community on Auditory Display. In: Proceedings of the 14th International Conference on Auditory Display. Susin P, Warusfel O (Eds); . In: Proceedings of the 2nd International Workshop on Interactive Sonification. York. In: Proceedings of the 2nd International Workshop on Interactive Sonification. Hunt A, Hermann T (Eds); York, U.K.: Interactive Sonification community. Supplementary Material for "Tangible Data Scanning Sonification Model"
Bovermann T, Hermann T, Ritter H (2006) : Bielefeld University. doi:10.4119/unibi/2699962. In: Proceedings of the International Conference on Auditory Display. Stockman T (Ed); London, UK: Department of Computer Science, Queen Mary, University of London: 77-82. In: Proceedings of the International Conference on Auditory Display. Stockman T (Ed); London, UK: Department of Computer Science, Queen Mary, University of London: 69-76. 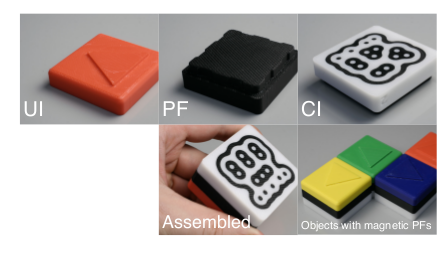 Supplementary Material for "A Malleable Device with Applications to Sonification-based Data Exploration"
Milczynsik M, Hermann T, Bovermann T, Ritter H (2006) : Bielefeld University. doi:10.4119/unibi/2700564. In: First International Workshop on Haptic and Audio Interaction Design. McGookin D, Brewster S (Eds); , 2. Glasgow, UK: 26-30. Supplementary Material for "The Local Heat Exploration Model for Interactive Sonification"
Bovermann T, Hermann T, Ritter H (2005) : Bielefeld University. doi:10.4119/unibi/2700941. In: Proceedings of the International Conference on Auditory Display. Brazil E (Ed); International Community for Auditory Display: 85-91. In: Proceedings of the 6th International Workshop on Gesture in Human-Computer Interaction and Simulation. Vannes, France.